Kashmir is a mostly mountainous region that has been fought over by Pakistan and India for the past 60 years. The area is sometimes referred to as the “Switzerland of the East” due to its fertile valley and snow-capped mountains. Due to the effects of global climate change the glaciers, whose melt keeps the valley fertile and is the source for many of the regions’ important rivers, are melting, jeopardizing water supplies for the region. There is already conflict between India and Pakistan, as India currently controls the area that is the source of Pakistan’s vital water resources. As a result, there is potential for an already tumultuous situation to become even bloodier as the affects of global climate result in shrinking water supplies and a scramble for control over the remaining water resources. Both India and Pakistan wish to control the Kashmir territory. Originally it was simply a boarder dispute, with each country wanting the land to enhance their regional control, but today the situation is more dire. With the water resources of both countries jeopardized by global climate change, they are in a race to ensure their countries’ future water security. The situation is more tenuous for Pakistan, as the source of their most important rivers, the Chenab, Jhelum and Indus, begin in the Indian managed half of Kashmir.5a If India had full sovereignty of Kashmir it could hold its enemy at its mercy, as water is absolutely necessary for the survival of a country’s economy, and its people. 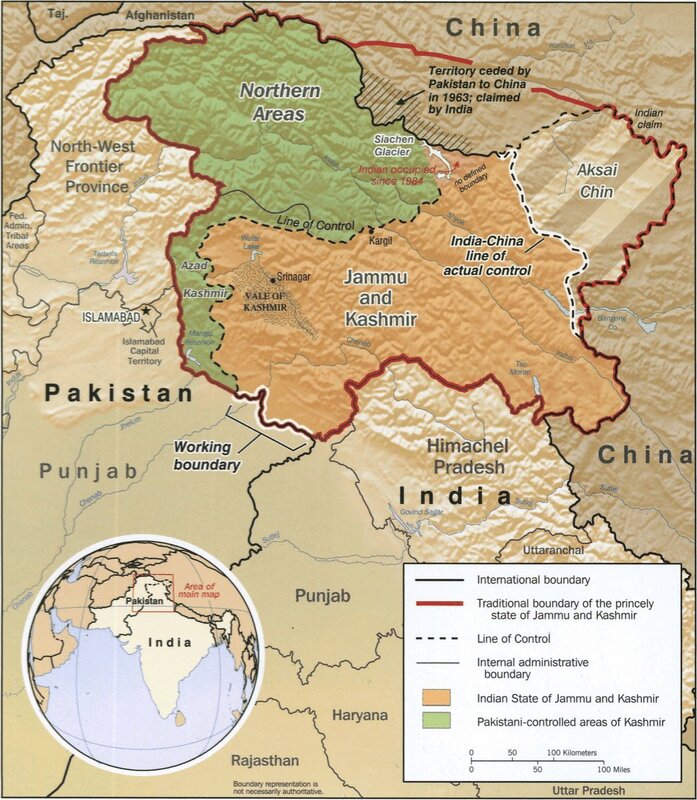 Despite ambiguous boarders for most of its existence, the true battle over Kashmir sovereignty did not commence until the UK relinquished control over the Indian subcontinent in 1947 and Hindus and Muslims were left to draw their own borders. The initial impetus to redraw the boundaries of the Indian Empire once Britain left was to create Hindu and Muslim countries. Kashmir is predominantly Muslim and therefore Pakistan believes they deserve to govern the region. While this case study most definitely can be defined as Global Warming, it is worth noting that climate change is essentially a sink issue. There is too much carbon dioxide in the atmosphere and it is affecting natural processes. 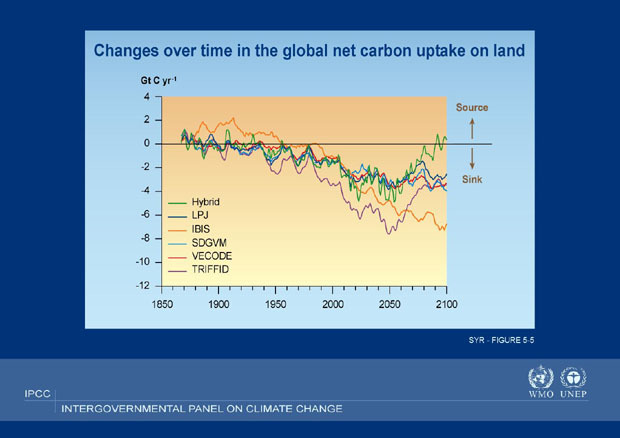 Climate change is occurring not in a specific location, but simultaneously around the world. Although India and Pakistan have significantly increased their carbon dioxide emissions within the past decade, the warming that we are now experiencing is a result of emissions that began accumulating since the Industrial Revolution. According to the United Nations Intergovernmental Panel on Climate Change (IPCC), climate change is expected to cause increased dry spells in already arid temperate regions, such as the Northern Areas. Areas that already receive a lot of rain, such as the southern Jammu and Kashmir area, can expect to receive even more, resulting in floods that can threaten the integrity of dams and levees. Flooding can also be expected to increase in the short term from increased glacial melt. That is until the glacier has melted entirely.9 The below IPCC graph shows that Kashmir is expected to experience warming above presumed global average increases. Climate change is caused by the combined emissions of all countries and will affect every sector of the global ecosystem. 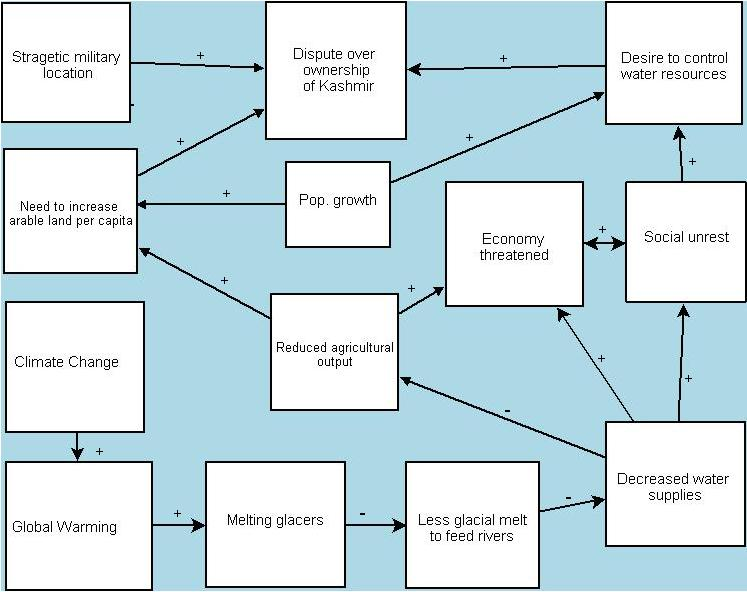 The conflict in this case study is the result of a commons act impacting the water resources of the Indian subcontinent. Between India and Pakistan over control of a disputed region along a shared boarder. The number of dead vary, depending on the source. The numbers I am quoting for the 1947, 1965 and 1971 wars are from the Atlas of 20th Century Death Tolls since it has the most sources quoted. These wars weren’t fought over Kashmir, per se, but rather were part of deeper issues; death totals are for the entire war, not who died in each region. In the 1947 war for national sovereignty it is estimated that at least 500,000 people died in the melee that ensued during mass migration.15 In the 1965 war about 4,000 Pakistanis and 3,000 Indians were killed and an additional 18,000 civilians from both sides. The numbers for the 1971 war are more complex. This was the Bangladeshi war of independence, as Bangladesh was once East Pakistan. Then number of dead from West Pakistan (now simply Pakistan) is about 8,000 and about 3,000 from India. It is estimated that at least 1 million and up to 3 million Bangladeshis died in this war, but will not be counted towards the Kashmir fatality total. The total dead from both countries from all three wars is about 536,000. Currently, the conflict is indirect, in that the problem stems from reduced water supplies in the near future. 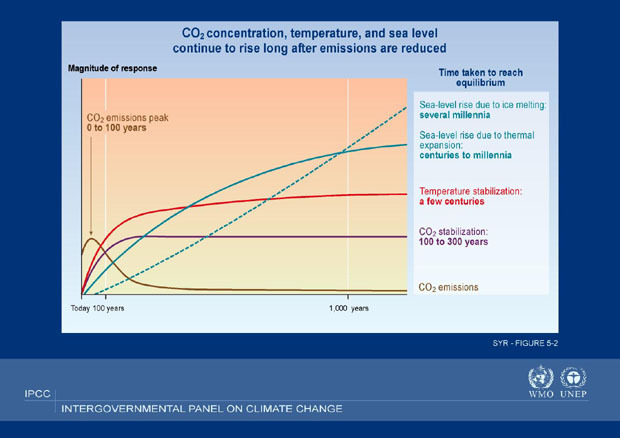 As the causal diagram above shows, climate change will affect many aspects of the environment and life. The inability to maintain a current standard of living, or prevent the continuation of economic growth, will not please Pakistanis nor Indians, putting further pressure on the government to escalate assertion of control over Kashmir. Milder climates and reduced glacier size will open up the previously inaccessible mountains, making them desirable land. Not only does it offer more area to accommodate population growth, but it also allows for the exploration and exploitation of previously inaccessible natural resources. Mountains are also ideal strategic military locations, as they allow for easy hiding from your enemy, as well as offering valuable views of the land, and any enemy operations, down below. Punjab, Pakistan’s heavily populated province and home of the nation’s capital, Islamabad, means “The land of the five rivers”. Three of these rivers begin or pass through the Indian controlled Jammu and Kashmir region.18 It is in the interest of Pakistan’s national security for it to have control over the origin of its water resources, rather than their enemy. Thusly, Pakistan has been trying to cement its authority over Kashmir by increasing their presence. In 1981 Pakistan extended Pakistani citizenship to all inhabitants in the Northern Areas .19 It is hypothesized that Pakistan galvanized settlement of the mujahideen, beginning in the 1980s, in the Northern Areas to enhance their military presence.20 Mujahideen is any Muslim involved in a battle or struggle. In this instance they can be thought of as a militia deployed or serviced by Pakistan as an aggressive means to enhance its control of the region. Since the conflict is really only in its infancy, there is no outcome yet, and predicting the future is very subjective. As of now there is merely a lull in the fighting, and nothing productive has come from negotiations. The battle over Kashmir will become a battle over resources, but it is important to remember, it originated as a religious dispute, when India and Pakistan separated. Wars over religion rarely, if ever, come to a neat conclusion, and it is hard to imagine that this case study will share a similar fate. As the below related cases support, by and large no conflict regarding water rights has ended amicably, if it conclusively ended at all. Water is essential for economic development, and developing countries like India and Pakistan need every resource available to propel their economy and in their desperation to get ahead they are not willing to compromise. No.14 - Litani The case study of Israel and Lebanon over development of the Litani River water source is similar in that there are two already conflicted countries battling over access to water supplies that both countries depend on. There had been two wars over the water supply before but the conflict now is low and has ended in a stalemate. No.193 - Niger-locust - Events that can probably be attributed to global climate change have stressed this already conflicted region. Similarities- Glacial melting due to global climate change will probably also exacerbate the tension of the already conflicted Kashmir. No.71 - Bluenile The Nile water basin is the water source of Tanzania, Rwanda, Burundi, Uganda, Congo/Zaire, Kenya and Sudan. Egypt and Sudan specifically depend on the Nile River, whose source is in the highlands of Ethiopia and Eritrea. The growth and stability of Egypt and Sudan depends on the access to water and there has been historical conflict between the two nations over water rights. Similarities-The water source of one country is in the hands of an unfriendly neighbor. Similarities-Tensions between Sudan and Egypt are exasperated as Sudan, which is upstream, has control over Egypt’s water. This is comparable to India’s control of the glacier that feed’s Pakistan’s vital Indus River. No.20 - Assyria This case study investigates a regional dispute in the Middle East over who has the right to develop water resources that more than one country relies on. This is pertinent, as who ever controls Kashmir will be able to control water sources that both countries depend on. Conflict over water development has been an issue in the Tigris-Euphrates river basin for thousands of years, with no resolution of the dispute to date. No.108 - Senegal-Mauritania The conflict originated over Senegal declaring their intention to develop their shared river border, which caused Mauritania to worry over the reliability of their water supply. After a short war Senegal decided not to go along with the project, but development and access rights are still being disputed without any resolution to date. No.176 - Korea-dam A dispute between North and South Korea, North Korea announced its intention to construct a huge dam that would reduce the flow of a vital river resource in South Korea and would be potential hazard to South Korea if it should fail. North Korea built the dam anyway so South Korea built its own dam to mitigate any potential water problems. Despite this there is still a low level of conflict between the two countries. 2. Khadka, Navin S. “Himalaya glaciers melt unnoticed”. BBC News. 11/10/04. 3. “New Delhi warned by military on Kashmir glacier deal with Pakistan”. Agence France Presse. 11/3/06. 4. “Siachen glacier melting fast due to military activity: study”. Zeenews.com 12/30/06. 5. Loudon, Bruce. “Nuclear rivals' Kashmir detente a poke in the eye to bin Laden”. Weekend Australian. 12/16/06. P.28. 5a. Raman, Anita D. "Of Rivers and Human Rights: The Northern Areas, Pakistan's Forgotten Colony in Jammu and Kashmir." International Journal on Minority & Group Rights 11.1/2 (2004): 187-228. Academic Search Premier. 29 April 2007. http://search.ebscohost.com, 192. 6. “Kashmir." Encyclopædia Britannica. 2007. Encyclopædia Britannica Online. 29 Apr. 2007 <http://www.britannica.com/eb/article-9043328>. 18. Raman, Anita D. "Of Rivers and Human Rights: The Northern Areas, Pakistan's Forgotten Colony in Jammu and Kashmir." International Journal on Minority & Group Rights 11.1/2 (2004): 187-228. Academic Search Premier. 29 April 2007. http://search.ebscohost.com, 192. 19. Raman, Anita D. "Of Rivers and Human Rights: The Northern Areas, Pakistan's Forgotten Colony in Jammu and Kashmir." International Journal on Minority & Group Rights 11.1/2 (2004): 187-228. Academic Search Premier. 29 April 2007. http://search.ebscohost.com, 204. 20. Raman, Anita D. "Of Rivers and Human Rights: The Northern Areas, Pakistan's Forgotten Colony in Jammu and Kashmir." International Journal on Minority & Group Rights 11.1/2 (2004): 187-228. Academic Search Premier. 29 April 2007. http://search.ebscohost.com, 208.